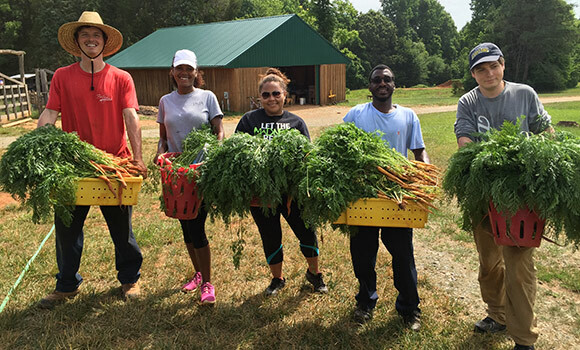 UNCG Spartans harvest food for donations at the Guilford College Farm. Nearly 200 UNCG students will spend their Saturday morning serving the greater Greensboro community at the 10th annual Spartan Service Day this weekend. The university-wide day of service, held each year during Rawkin’ Welcome Week, gives students the opportunity to leave campus and work with community partners on a variety of service projects. This year, students will work at 11 sites across the city and surrounding area, including the Greensboro Children’s Museum, Peacehaven Farm and BackPack Beginnings. New service project sites include Grove Street Community Garden in the nearby Glenwood neighborhood. The student staff of the Leonard J. Kaplan Center for Wellness will partner with neighborhood members to plant flowers, spread wood chips and build a pallet compost bin, a project that also serves as the culminating event of the Kaplan Center’s grand opening week celebration. Additionally, OLSL will host its annual Volunteer & Service-Learning Fair on Tuesday, Sept. 6, in the Elliott University Center’s Cone Ballroom. The event, held from 11 a.m. to 2 p.m., is an opportunity for students, faculty and staff to meet more than 50 community partners and learn more about volunteer work, internships and partnerships for service-learning. For more information about OLSL and how to get engaged with service projects across campus and in the community, visit olsl.uncg.edu. Are you performing service work on Saturday? Share images of your work and the university will share its favorites on social media. Tag photos and videos #UNCGservice on Twitter and Instagram.